Replaceable, high-quality nylon brushes and bore mops on a durable handle provide all-at-once brushing and lubrication for most popular revolvers. SPECS: Black, nylon plastic handle 4" (10cm) long, 9" (27cm) OAL. 8-32 tpi. Utskiftbare, høykvalitets nylon børster og bar mopper et solid håndtak gir alle sammenhengende børsting og smøring for mest populære revolvere. Spesifikasjoner: svart, nylon plast håndtere 4"(10cm) lang, 9" (27cm) OAL. 8-32 tpi. I have used these speed brushes for years, mostly at PPC matches. Shooting 150 rounds per match, lead rings can build up in the cylinder and cause problems reloading. I keep one in my shooting box and after the command to load, it is an easy step to run the speed brush in and out of the cylinder a few times before I load. Cleans things up nicely and in a hurry! If you want a "deep clean", use a single rod and a metal brush. If you want a good, fast, clean - these are the ticket. The design behind this cleaning tool was inspired by a fine idea, but physical result fell short I think. 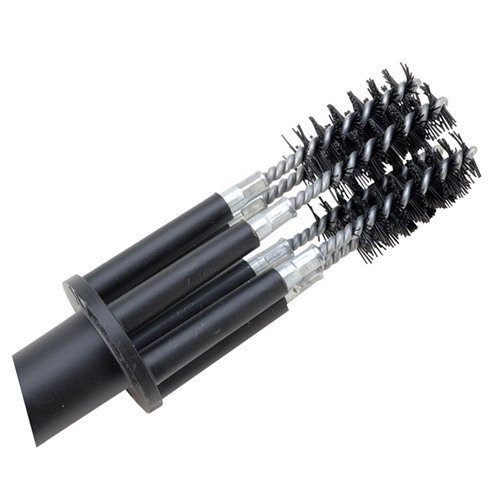 The 5-Brush end fits into the cylinder very tightly, which is good, but as such it's very difficult to brush back and forth. All the while I was afraid if I used more force, the metal cores of the brushes would snag and/or scratch the gun's finish. So the only option was to push it in on the front of the cylinder until it stopped and then do the same thing on the other side. Afterwards, an inspection of the chambers indicated the brushes hadn't removed much fouling. On the other side of the tool, there is a single brush that you can slide out of the handle via a sliding button in the form of a phillips head screw. This brush was much more effective as it was easier to control and the handle is comfortable to use and made of a non-marring plastic. The downside though is that you have to constantly apply forward pressure to the aforementioned screw head in order to keep the brush exposed from the handle, as it naturally wants to slip back. In the end, for what this tool costs, I think a rifle-sized nylon brush on a short brass rod or other threaded handle would do the same job as this tool only with less "gadgetry", and it wouldn't take you much longer either. Produsentnr. : K3P Utskiftbare, høykvalitets nylon børster og bar mopper et solid håndtak gir alle sammenhengende børsting og smøring for mest populære revolvere. Produsentnr. : LN3P Utskiftbare, høykvalitets nylon børster og bar mopper et solid håndtak gir alle sammenhengende børsting og smøring for mest populære revolvere. Produsentnr. : N4P Utskiftbare, høykvalitets nylon børster og bar mopper et solid håndtak gir alle sammenhengende børsting og smøring for mest populære revolvere.